You may have read our recent reports on the Charity Darts Match between The Handlebar Club and The Pipe Club of London organised by member of both clubs Alan "Rocky" Rockliffe, in aid of the Childrens' Liver Disease Foundation. Through Rocky's efforts £500 was raised for the Charity, which has been providing his own critically ill grandson Jack aged seven months, with crucial advice and support. Sadly, little Jack has since lost his battle with illness and passed away on Thursday 18th November. Alan has asked us to reproduce this article from The Enfield Advertiser, as a tribute to the little boy's memory and to promote the vital work of the Childrens' Liver Disease Foundation, which continues to fund research into childhood liver disease. When Steve Parsons was asked to talk to a design consultancy involved in promoting Movember about the importance of the month long charity event and the problems of prostate cancer, the obvious thing for him to do was to borrow a prostate examination simulator and give everyone a hands-on lesson in prostate examination... Read Steve's probing report on the experience, and see our Potty President's latest dual-control appendage, all waxed and ready for action. It would be superfluous to add much to The British Beard Club's musings on the occasionally annual Darts Match between the Handlebar Club and the Pipe Club of London. I'm sad to announce the death of Club Member Stuart Naylor, who died peacefully on Monday the 13th of July this year in St. Catherine's Hospice in Scarborough. Our belated condolences go out to his family. This week the annual fundraising moustache (mo) fest known as Movember was launched for 2009. During the month formerly known as November there will be new moustaches sprouting across the nation and the Handlebar Club is proud to support and nurture these hirsute efforts. Our hairy President Rod was on hand to meet moustache lovers and growers at the launch event in Camden, London. As you can see he spent most of the evening dispensing words of avuncular wisdom to the lovely ladies of Movember. You can join in the fun at uk.movember.com. The Gründau-Steinau Beard Club celebrated its 25th Anniversary with an international Beard and Moustache competition in Germany, and Andy Lear was there, with a lot of familiar and some not-so familiar moustaches and beards from the Championship circuit. Read his gripping report about elastic, cheese and blackberries, and as usual hardly anything about the competition. From The British Pathé Digital News Archive. Click on the thumbnail, then on the Play button that appears. "The party is, in fact, a contest to see who can swallow spaghetti fastest - the beauties from London's Talk of the Town, or the hairy gentlemen of the Handlebar Club - who are recognised (in some places!) World Champion Spaghetti Eaters"
19 members of Belgian-based club Europese Snorrenclub Antwerpen lead by their President, Willy Dupon will arrive on 9th October for a 3-day visit to London. The Handlebar Club is delighted to meet and entertain them on the evening of Friday 9th October at the Windsor Castle - this is in addition to the regular first Friday the weekend previous. 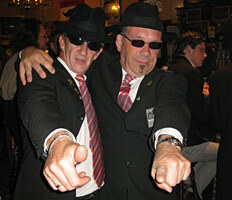 Thatcher's Arms, Great Warley, Brentwood, Essex - venue for the Darts Match. As heralded at the 2009 AGM, the annual Darts Match with The Pipe Club of London has been resurrected, and will take place at Thatcher's Arms in Great Warley, Brentwood, Essex from 14:00 on Saturday 17th October 2009. It will be a charity event as usual with proceeds going to the Children's Liver Disease Foundation, a charity close to the heart of HBC and PCoL member Alan 'Rocky' Rockcliffe. Put the date in your diary, find the way there, and get your eye and a pint in for 2pm on the day. Such is the power of The Internet and 'The Web' - (oh, are they two different things? Well, yes and no - one is the carrier for the other) - that the generously-moustached gentleman we were looking for is quickly found and established as Paul Larsen, our latest Overseas member. You can find out more about him in the Gallery of Members. 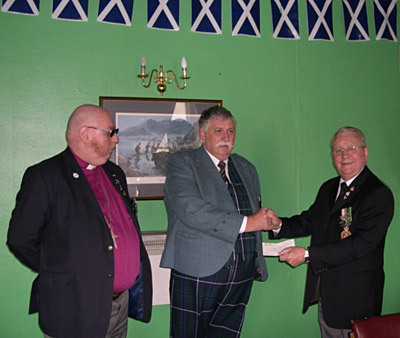 On Saturday 19th June in Stirling, Scotland, The Handlebar Club treasurer Alex McBride (centre) presented a £100 donation to The Scottish Veterans Association chairman Mr John Richardson ex. RAMC (right), accompanied by SVA Secretary and Handlebar Club member Rev Dr. Bill Mackie (left). 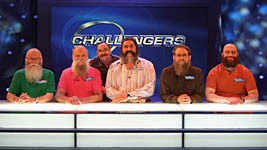 Following in our footsteps of last year, our brother club The British Beard Club recently challenged the Eggheads team in a closely-fought bid to dislodge them from their proverbial wall. Did their team of buttered bearded soldiers beat those hard-boiled eggsperts, or were they left pointed end up and past their shell-by date with scrambled brains? You'll have to wait rather more than 4 minutes for the answer by watching out for the show on BBC2 Television! Andy Lear's 427 stanza epic poem The Battle Of The Haggis, written to honour The Halbert of McHalbert's valiant struggle during the 2009 AGM in Edinburgh, has received less attention than it deserves (it says here). Now, in its full glory with witty illustration by Kate Harrison, it becomes obvious where true artistic genius lies. Judge for yourself and relive The Glorious Fourth of April. 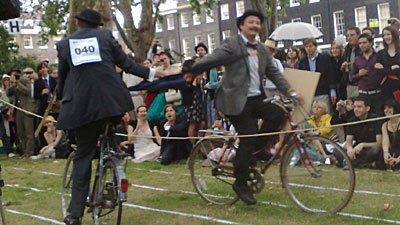 Our indefatigable comedy team of Lear and Hill indulge in more caddish capers at the 2009 Chap Olympiad. Join in the fun with Andy's usual entertaining account of, amongst other chappish delights, The Moustache Tug of War and The 100 Yard Tash in this annual event for Chaps and Chapettes organised as ever by the The Chap Magazine. 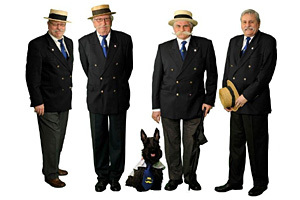 I'm sad to announce the death of Club stalwart, Henry James, on Saturday 20th June 2009. He has been and will be sorely missed by all of us who knew him. Our condolences go out to his family. His funeral is at 2.30 on 2nd July at Prestwold Church, Prestwold, Near Loughborough. Afterwards at the Greyhound Inn, 25 Melton Road, Burton on the Wolds, Nr Loughborough. Family flowers only but donations to Cancer Research UK. Smiling bearded faces - Watch out Trondheim! 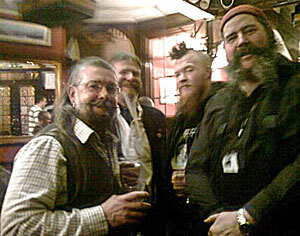 The third bi-monthly meeting of The British Beard Club took place at The George Inn, Borough High Street, London on 21st June 2009. It was a great success for the new Club, and was the most-attended meeting so far. Read TBBC Organiser David Dade's illustrated report. The next World Beard and Moustache Championships is on May 17th, 2011 in Trondheim, Norway, so you have still have time to grow a competition-quality moustache or beard! If you want to try growing more than just a moustache, why not join The British Beard Club and they'll help and advise your beard growth progress. 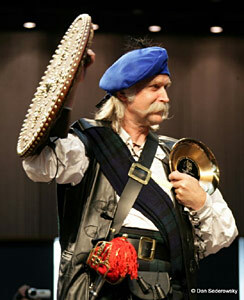 Keith Jefferson's 11-inch Moustache in the News - and on Video! Keith said,"I am a great fan of the TV programme Eggheads and a group of men from The Handlebar Club were on that. I decided to join and enter the competition." The Handlebar Club's annual visit to Belgium took Steve Parsons to the 2009 Antwerp Moustache of the Year event, hosted by Snorrenclub Antwerpen. Steve describes a weekend of processing through the streets of Antwerp then drinking more Belgian beer, and you'll find out what the town of Leuven is famous for. The Handlebar Club World Beard and Moustache Non-Alaska Awards 2009 contest took place in a leafy Kent village while all the fuss continued in Alaska. Tom Cutler recalls what he can remember about the event. 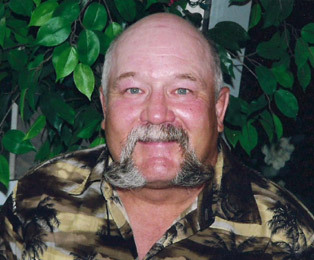 Member Keith Jefferson wins Natural Moustache, 2nd Place! The World Beard and Moustache Championships 2009 took place in Anchorage, Alaska, USA on May 23rd, and Andy Lear recounts The Handlebar Club team's experiences, what he drank and ate, and hardly anything about the contest itself, as usual. Talented student photographer Rokas Darulis featured some of our members in his BA degree show, held at the Old Truman Brewery in Brick Lane from June 4th to 8th. Take a look at Rokas's impressive work. The 'Moustache' section is the one you're after. The Swedish Moustache Club's 25th Anniversary. The Svenska Mustaschklubben is based in Malmö, Sweden, and was founded in 1984 by Swedish members of the Handlebar Club. 2009 sees their 25th Anniversary celebrations, which take place on 4/5th September in the Swedish city of Köping, near Stockholm. There's more about the club on their Web site. Click on the Union Jack for the English translation. 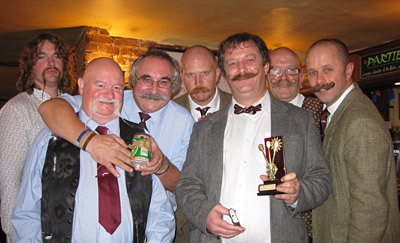 For many years the Handlebar Club appointed a "Prime Handlebar". 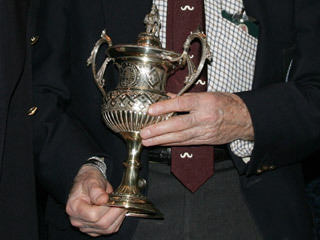 George Hoffman was the first, being appointed at the inaugural meeting of the club in 1947. Thanks to a previous AGM's decision to resurrect this ancient office, this year's meeting in Edinburgh saw the hallowed trophy presented for the first time in recent memory. 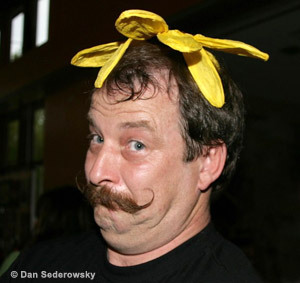 As part of the Handlebar Club's commitment to Movember, the charity dedicated to growing moustaches to raise funds and awareness for men's health, your Club's President and Secretary gallantly attended the Movember Gala party as celebrity moustache prowess judges with allegedly expert knowledge of the 'Mo'. Steve Parsons' report shows us just how difficult their job was, and reveals the contest winner on the night in a terrifying conclusion! Hair � Who Let The Dogs Out? All that is weird and wonderful about hair. Back in November 2008 several intrepid members of the Handlebar Club shared the bill at an event at The Wellcome Collection in London with a number of pedigree show dogs. Steve Parsons' report tells how the fur flew, and we see an unexpected prospective member proving that the event was an unusual evening to celebrate all that is weird and wonderful about hair. 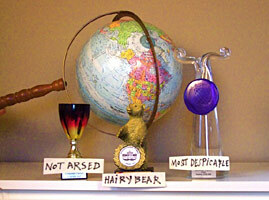 Prospective members of The British Beard Club will meet on Friday 13th February to commence the new Club's formation. There has been interest from beard enthusiasts from all over the British Isles; from London, Southern, Eastern, Northern and Middle England, the West Country, the Scottish Highlands and Lowlands, Wales, Northern Ireland, France, Belgium, the East and West coasts of the USA and from Canada. Some of those beard enthusiasts who are interested in creating and joining the new Club will meet each other and the founder of The British Beard Club, David Dade for an informal first meeting at The Cockpit, St. Andrew's Hill, London, EC4V 5BY in Blackfriars, London on 13th February 2009 from 6:30 pm. The Cockpit is a small-scale City real-ale pub with hand-pumps, and has a very friendly and intimate atmosphere. It's reported that their Scotch Eggs are also not to be missed! Would you like the chance to win a big cash prize? "1 vs 100 is an exciting quiz show, in its fourth series, presented by Ben Shepherd on the BBC. The show follows a simple format and pits one person against 100 others in a battle of brains with the chance to win a big cash prize. We are currently looking for people 18 years or older with great personalities and a good general trivia knowledge, to take part in the show." "You don't need to be the brain of Britain; 1 vs 100 is a fun, light-entertainment quiz show for all the family to enjoy. If you or your colleagues would like the chance to win a big cash prize you can request an application form by emailing 1v100-3@endemoluk.com".